Larnaca, ancient Kition. The home of the Stoic philosopher Zeno, has one of the most beautiful and oldest churches in Cyprus: the church of Saint Lazarus, the friend of Christ. It was built on the very sepulcher of the Saint, who, according to tradition, was the first Bishop of Kition. For some relative informations, let us go back into the past. St. Lazarus (Eleazar in Hebrew) was a Jew from Bethany, a small town about 3 kilometers east of Jerusalem. He is Known as “the friend of Christ” who, after being dead for four days in the tomb, was raised by Jesus (John 11,11). The Bible, indicating the friendly relations of the Lord with the whole family, says: “Jesus loved Martha and her sister [Mary] and [their brother] Lazarus” (John 11,5). Several times Christ had enjoyed their hospitality. At one time, during His last journey from Galilee to Jerusalem where He was going in order to be crucified “ for the life of the world ” (John 6,51), and while yet being far away, the two sisters informed Him that their brother, being seriously ill, was dying: “Lord, the one you love is sick”. And the Lord who declared that “this sickness will not end in death”, but was “for God’s glory so that God’s Son may be glorified through it”, delayed His departure for two days and then continued to Bethany where He arrived four days after the burial of Lazarus. “Deeply moved in spirit”, He stood in front of the tomb and – being the Master of life and death – He raised Him, although “he had been there four days” and “ there was a bad odour” (John 11, 1-44). Later, Lazarus was forced to seek refuge in Kition of Cyprus, escaping from the plot of the chief priests and the pharissees who sought to kill him: “So the chief priests made plans to kill Lazarus as well, for on account of him, many of the Jews were going over to Jesus and putting their faith in Him” (John 12, 10-11). Most possibly, the time of his escape is considered to be the year 33 a.C. and, more precisely, the period of the persecution which burst out after the stoning of Stephen, when many Christians of Judea “been scattered by the persecution in connection with Stephen, travelled as far as Phoenicia, CYPRUS and Antioh”(Acts 11.19). According to the tradition of the Church, Lazarus was thirty years old at 33 a.C. when Christ raised him from the dead. And he lived another thirty years in Kition of Cyprus, and died in about 63 a.C., at the age of sixty. The Apostles Paul and Barnabas faund him here when they came to Cyprus at 45 a.C. and consecrated him as the first bishop of Kition. According to this, he had been the shepherd of the christian flock of this town for 18 years (45-63a.C.). After that, he died for the second time and was buried in the place where his Byzantine church stands to-day. (See St. Epiphanios of Constantia Cyprus, “Contra heresies”; see also in the Lenten Triodion of the Orthodox Church, the synaxare of the saint’s name-day). We don’t know any details of his life as a bishop of Kition, because written records of that time did not exist or have not been preserved . However, his work, as well as that of his fellow-bishops of the first century Cyprus, could not have been easy, due to the strength of the two rival powers: idolatry on the one hand which, due to the worship of Aphrodite, was very popular in Cyprus ; and the fanaticism of the numerous Jewish community of Cyprus on the other hand. The Church of Cyprus had to fight hardly for a long time in order to predominate. Saint Lazarus’ stay in Larnaca is connected with various traditions. According to one of these, during the thirty years he lived after his resurrection, he never smiled except on one occasion, when he saw someone stealing a pot, when he smilingly said: “the clay steals the clay”. He was worried at the sight of the unredeemed souls he had seen during his four-day stay in Hades (the redeeming sacrifice of Christ on the cross had not yet taken place nor had his resurrection, which saved man from sin and eternal condemnation). Another tradition deals with the Salines (salt-lakes) situated in the outskirts of Larnaca. According to this, the Salines were formerly an immense vineyard. One day the Saint chanced to pass by, and being thirsty, asked the owner for some grapes to quench his thirst, but he refused to offer him any; and when the Saint pointed to a basket which seemed to be full of grapes, he replied that it contained salt. Then the Saint, to punish the wickedness and hypocrisy of those men, turned miraculously the immense vineyard into a salt-lake. Finally, it’s worth while to mention also another tradition, about our Lady’s and ever-virgin Mary coming to Cyprus, to visit St. Lazarus. According to this tradition, Lazarus was very grieved because he could no longer see the Mother of our Lord his friend; for this reason he sent a ship to the Holy Land, to bring Her as well as St. John the apostle and other desciples, to Cyprus. But while the ship with our Lady and Her companions was sailing towards Kition, a great storm in the sea carried them far away, in the Aegean Sea, on the shores of Mt. Athos, in Greece. From there, our Lady, after converting the idolaters to Christianity and seeking Her Son’s blessings and protection for all those who, in the future, were to “fight the good fight of faith” (as monks and ascetics) on that mountain , She sailed back to Cyprus. Finally, She arrived at Kition where She met Lazarus, to whom She brought, as a present, a bishop’s pallium, woven by Her own hands. Having blessed the local Church of Kition, She returned to the Holy Land. The tradition about the coming of Lazarus in Cyprus and his consecration as a bishop of Kition is widely spread throughout the Orthodox world, including distant Russia. (In fact, in the monastery of Pskov, in Russia, a church is dedicated to “St. Lazarus, bishop of Kition”). In old times the following custom existed in Larnaca: on St. Lazarus day, which is on Saturday , on the eve of Palm Sunday, various children, holding branches of palm-trees and headed by a boy represent ing Lazarus, being decorated with red poppies and yellow wild daisies bearing in Cyprus the name of “lazarus”, went round the houses of the parish, were the priests, chanted hymns about the raising of the Saint, and the children sang the “song of Lazarus” (a popular song in various versions). On the same day, in the yard of the church, in the presence of all the parishioners, took place a representation of the raising of Lazarus. Both the priests and the children participated in the ceremony. These two customs do not exist any longer. The church of St. Lazarus in Larnaca has been known to the christian world since the old times: until the early years of this century it was considered an indispensaple supplement to the pilgrimage of the Holy Land. Besides this, many illnesses were healed and other miracles were performed here owing to the Saint’w grace, as Pietro Della Valle, a Roman nobleman and traveler who visited Larnaca in 1614-1626 informs us: When he had expressed his doubts concerning St. Lazarus’ coming to Cyprus, he was given the answer that “this truth is proved by the miracles which the Saint works in his church daily” (Excerpta Cypria). Its importance, as a great place of pilgrimage, has been strengthened following the discovery of part of the sacred relics of the Saint in a marble sarcophagus under the altar. (This occurred on November 1972, during renovation work in the church). “Lazarus, the four-day dead and friend of Christ”. The then emperor of Byzantium, Leo VI the Wise, according to the prevailing custom, carried the holy relics to Constantinople, the capital of the empire, and in exchange, he sent money and technicians to build the church we see today. We cannot admit that the people of Kition gave all the sacred relics without keeping even a small part for their own town. The fact that only a small part of the relics were now discovered and not all of them, is a good evidence of their authenticity. On the eastern side of the marble sarcophagus which exists today beneath the altar, in which the few remains of the sacred relics were found, one can see the inscription in greek capital letters, of the word ΦΙΛΙΟΥ that is, “friend” in the genitive case. Most likely, this sarcophagus had replaced the original one, if we accept that this was transferred with the main part of the relics to Constantinople. The event of the transport of the holy relics from Kition to Constantinople was immortalized by Arethas, bishop of Caesarea, in two of his famous speeches, made on the occasion. In the first speech he praises the arrival of the sacred relics from Kition to Constantinople, and in the second one he describes in detail the procession which the emperor formed to carry the relics from Chryssoupolis to the great cathedral of Saint Sophia. Leo, besides the church he had built at Kition dedicated to St, Lazarus, he also built a second one in Constantinople in honour of the Saint. After the capture of Constantinople by the Franks in 1204, the Crusaders, besides the other treasures they carried to the West, they also carried the Saint’s relics to Marseilles, from where, later, they disappeared and up to the present day they have not been traced. 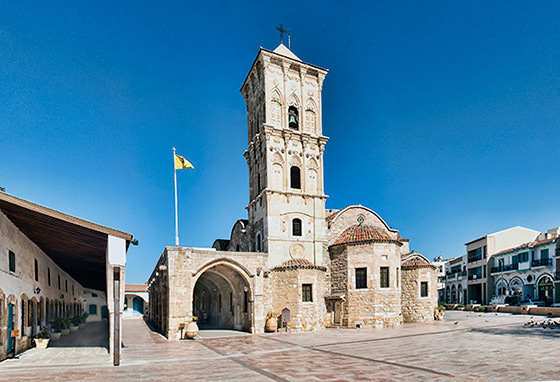 This famous ancient church of Saint Lazarus erected, as it has already been mentioned, on his sepulchre, is the most precious monument of which Larnaca is pround. Who can enter it and not be moved! An air of grandeur, emanating from early Christianity, a “doric” grandeur which impresses you, characterizes it. Its famous iconostasis, an excellent example of woodcarving, looks like an immense embroidery in gold thread. Innumerable figures of Saints adorn it; beautiful figures, “mystic”, filled with “the peace of God that surpasses every mind”, holy figures which, during the morning and evening service, seem to bring heaven down to earth. The beautiful iconostasis looks really like a celestial firmament, and its icons like “illuminating stars”, a true picture of “an assembly of the firstborn which are written in heaven” (Hebr. 12:13), a picture that reminds us so vividly of the world beyond. The church of St. Lazarus is one of the two three domed churches that exist to-day in Cyprus (the other being that of St. Barnabas’ monastery, near Famagusta). These two churches differ from the other multi-domed churches of Cyprus, and belong to a rare architectural type. It was built, as already mentioned, late in the 9th century (about 890A.D) by Leo VI the Wise, emperor of Byzantium. It is all built of stone with three aisles and three domes in a row over the middle aisle. Its three domes are today cut off from their basis; according to tradition, these were pulled down during the Turkish occupation of the Island, when a Turkish officer of high rank ordered their demolition, because, on entering the port of Larnaca, he kneeled and prayed seeing them, considering them to be the domes of a mosque. According to another view, they were destroyed by earthq uake on an unknown date; in 1734, however, when the Russian monk Vassili Barsky had visited the church they had been already destroyed. Towards the end of the Frankish period (1191-1571) according to one view, or about 1750 according to another (when works of restoration had been carried on by bishop of Kition Makarios A’) the arcade which we see on the south side of the church was erected. In 1857 the present campanile was built. Until then, the church did not have stone belfry and the bells were fastened on wooden pillars on a pedestal. It is know that since the occupation of Cyprus by the Turks in 1571 until the middle of the 19th century, all beifrys were banned by the conquerors as well as the use of bells in christian churches. The ban was lifted in 1856 after a demand lodged by Christian Orthodox Russia, but even then, the use of bells was allowed only after obtaining a permit from the Vizier. In Nicosia, only in 1858 a single bell was allowed to be put in the Phaneromeni church. 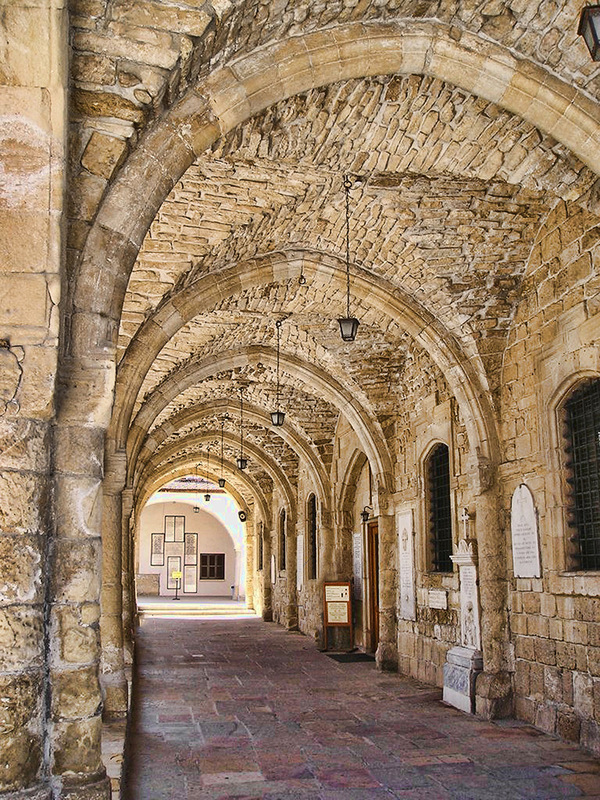 The church of St. Lazarus in Larnaca however, had bells long before 1856 and the Turks tolerated this, owing to the fact that the people of Larnaca had freer movements because of the existence of the foreign Consulates and of large European colony in their town. But long before, during the Frankish period (1192-1570), the church ought to have had an other belfry equally imposing, as this can be seen in old plans of the town of Larnaca published in Europe by travellers of the past centuries, in which the church of St. Lazarus figures with its domes intact and with a very high belfry Wide for ex., 01. Dapper, “Naukeurige”, Amsterdam 1688). This must have been pulled down later by the Turks. As the Byzantins did not build high belfrys, we suppose that this had been built during the Frankish occupation according to the Italian style of high beifrys. The windows of the church were formerly, far smaller and narrower than those of today, and let little light get into the church, according to the requirements of the Byzantine church architecture. Wide Impressions of Seigneur de Villamont, a foreign traveller of 1589, in “Excerpta Cypria”). Generally speaking, the architecture of the church, which is of a rare old style, seems to have impressed the foreign travellers, as we see in their published impressions: Alexander Drummond, for example, an English Consul at Aleppo, Syria, who visited Cyprus in 1745, writes the following: “In the town of the Salines (as Larnaca was the known to the Europeans) there is a church dedicated to St. Lazarus; its architecture is such that I have never seen before”. Also, the person mentioned before, Pietro Della Valle (1614-1626), describes the church as “an old one, built in a very beautiful architectural style”. 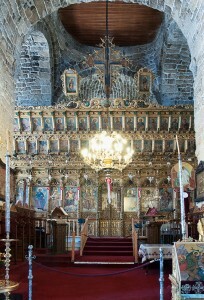 The iconostasis, is of exceptional art and is considered as one of the finest examples of wood carving in Cyprus. 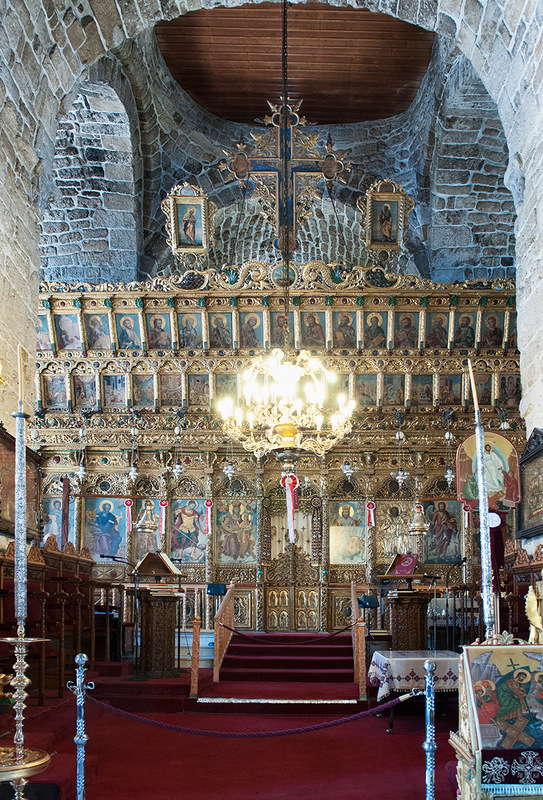 This one, as well as that of Tripiotis church at Nicosia, which is equally fine, were made by the eminent carpenter Hadji-savvas Taliadoros, who came from Nicosia. Its construction began in 1773 and was completed in 1782. A short time later, in 1793-1797, it was covered with gold, and the icons’ paintings on it were completed by the painter Hadji-Michael and his apprentices or associates. The iconostasis is adorned with 120 icons of wonderful craftsmanship; 13 big ones in the lower row and 60 smaller ones in the two upper rows (30 icons in each), 25 at the doors to the Sanctuary and 4 in the combination of the Crucifix at the top with a symbolic representation of the “pelican” at the base of the cross. The rest are small cyclical icons, 16 half the height of the iconostasis and 2 at the top. The altar is a masterpiece of wood –carving (a product of 1773), as well as the bishop’s throne with the icon of St. Lazarus, dating 1734. In the following precious old Byzantine icons are kept, belonging, most likely, to an earlier iconostasis. One, is that of St. Lazarus as a bishop bearing a multi-cross chasuble; another, of byzantine popular art, is that of the raising of Lazarus; four other big icons placed on wood-carved stands that adorn the four piers of the central dome, are: a russian icon of the Virgin covered with silver gilt, another of the raising of Lazarus, one of Saint Nicolas and one of Saint George with scenes from his life, dating 1717, a work of Jacovos Moscos, the cretan. It seems that in former times the inside of the church was covered with frescos because, until the last century some frescos could be traced on the piers of the central dome. These frescos must have been destroyed probably by the abundant humidity in the vicinity of Larnaca and especially of the Scala quarter, where the altimeter is slightly higher than that of the sea. (Until the middle of the last century the land south-west of the church, as far as the Salt-lake, formed an immense marshy place known as the “Lakes of St. Lazarus”. In very old times when the Scala area (St. Lazarus quarter) was still uninhabited and the town confined to old Larnaca, St. Lazarus church, lonely as it was, functioned as a monastery. During the Frankish occupation it was converted by the Franks into a Benedictine (Roman-catholic) monastery, while for a short time it came under Armenian Roman-catholics. When the Turks conquered Cyprus in 1570 they occupied the church, as they had done with all the churches possessed by the Latins, until 1589 when the church was given back to the Orthodox christians for 3000 coins. At the same time, the Roman-catholics were allowed to have religious services twice a year, on St, Lazarus’ day and on Mary Magdalene’s day, in the small chapel adjoining the sanctuary in the north aisle of the church. This privilege was revoked in 1794 owing to Ithe efforts of Archbishop Chrysanthos (1776-1797), because the Latins, quoting their privilege, laid claims of joint ownership to the church. At the north entrance to the church, there still exists the five-cross emblem of the Latins (also known as the Jerusalem cross), and in the north aisle, in the small chapel adjoining the sanctuary, the small latin altar is still preserved as an evidence of the Roman-catholics’ presence in the years gone by. Early in the 18th century, when the Scala area was growing into a second town near the old town of Larnaca, the church of St. Lazarus was made the parish church of the whole new town of Scala. Until the middle of the middle of the 19th century, it was still known as a “Monastery” (as the relevant documents of the period testify), despite the fact that long before it had ceased to be such. The rooms and cells all round, the monastic ritual preserved, the many divine services, and the numerous church staff it had, still gave it the aspect of a monastery. The divine services in this church were always conducted with a certain dignity and magnificence. The rooms adjoining the church were formerly about twenty in number, and were used in the past centuries as hotels where travellers, pilgrims and traders stayed. On the north-west side of the yard, there is situated a small Protestant cemetery, with beautiful marblecarved graves, where European merchants, sailors, English Consuls and American missionaries were buried. 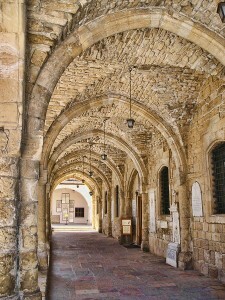 The church of St. Lazarus was bound up in a unique manner with the life of the people of Larnaca. – But before we continue, let us give, here a short reference of the history of the town. The twin towns of Larnaca and Scala, that formely were about one smile apart, were built during the Middle ages at the site and on the ruins of ancient Kition. Originally, during the Franco-Venetian occupation, (1192-1570) only Larnaca existed as a town, situated one mile from the sea, know to the Europeans by the name of Salines (salt-lakes), whereas Scala, known to the Europeans as Marina, was made up of port stores and a small settlement around the church of St. Lazarus, for the needs of the port and the exploitation of the salt-lake (whose salt, collected by far larger quantities than today, had a great demand in Europe because of its exceptional quality). In the 15th century when the port of the medieval Famagusta declined, that of Larnaca was improving to such a degree, that for five centuries (15th to the close of the 19th) it was one of the leading ports in the eastern Mediterranean, and one of the most important centres for the trans-shipment of merchandise between Europe and the Middle East. That’s why various european countries of that time, France, England, Austria, Naples, Venice, Ragusa, Sicily, Spain, Russia, Greece, Holland and others, had established in Larnaca their colonies and Consulates. With the importance that its port was beginning to acquire and the frequent sailing of vessels, the insignificant, until then, seaside settlement was animated, especially towards the end of the 17th century-early in the 18th , and gradually a new town was springing up, the town of Scala. During the second half of the 18th century it was already a flourishing small town close to old Larnaca, with a european air in its life because of the presence of hundreds of Europeans (traders, Consuls and others), who had settled permanently in the twin-towns. Thus, during the Turkish occupation, the town of Scala-Larnaca was the only window of Cyprus to the outside world, and the point of contact with countries overseas, a beam of light and civilization during those hard days of slavery. While Nicosia was the administrative capital of Cyprus, Larnaca was the diplomatic and commercial centre; until the beginning of the 20th century it continued to be the leading factor in the social, educational, cultural and commercial life of the Island. But after the Consulates were transferred to Nicosia and the improvement of the ports of Famagusta and Limassol, Larnaca began to decline and lost its old splendour and importance. The affairs of the church were in the hands of a Committee appointed, up to 1854, according to merit; after 1854 the Committee was elected by the parishioners. Sinced 1734 the members of the Committee and their activities have been on record; before that date we have no written evidence. During the Turkish occupation the church Committee was considered as the Committee of the whole Scala community, being highly esteemed by the townsmen who referred to it for the solution of their problems; at the same time, the Turkish authorities looked upon it as factor that had to be considered. In Education the role of the church of St. Lazarus was really unique. Early in the nineteenth century, in Scala-Larnaca there were functioning private schools which only a few rich people could attend. For this reason, round about 1850, the church founded public Schools undertaking jointly with St. George monastery in Larnaca their maintenance, until the first decades of the present century. One of these public schools were founded in 1857 in the yard behind the church; the building is still preserved with a relative inscription on the facade. During the years of the Turkish occupation and the first decades of the British administration, the church played also an eminent role in the field of philanthropy and social welfare, because such institutions were lacking from the part of the State. Finally, it must be noted that when the president of the church Committee was the historian Dr. N. Kyriazis (1922-24 and 1927-28) a “Museum of St. Lazarus” was created; this was housed in the above mentioned building of the public School in the yard, behind the church. The Museum contained many byzantine icons (which, most likely, belonged to an older iconostasis) and other church treasures. Unfortunately, these objects were later removed to the Castle, in the Turkish quarter of Scala, where the Larnaca District Museum was situated; as a result, during the turkish riots of 1963 those objects fell into turkish hands and disappeared. Today (Saturday before Palm Sunday) and the eve of that day. On these days the people of Larnaca feel nearer to the Holy Places; they live the divine Drama and the glorious moments that precede the Resurrection, in a second but real “Bethany”, close by the tomb of the beloved friend of Christ. This is in brief, the history of the church of St. Lazarus the friend of Christ, first bishop of the see of Kition and Patron Saint of Larnaca, whose second and final tomb is jealously kept in this beautiful, one thousand hundred years old, byzantine church.